The term bohemian was first used in the nineteenth century to describe a subculture of marginalized and impoverished artists, writers, musicians, and actors in major European cities. 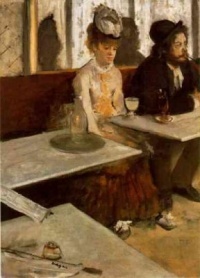 The bohemian lifestyle is often associated with coffeehouses, drug use (particularly opium), alcoholism, and absinthe. Bohemians were associated with unorthodox or anti-establishment political or social viewpoints, which were expressed through free love and voluntary poverty. 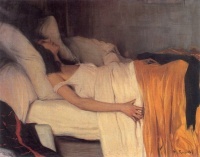 The term emerged in 19th century France when artists and creators began to concentrate in the lower-rent (the proverbial garret), lower class gypsy neighbourhoods. The term "Bohemian" reflects a belief, widely held in France at the time, that the Gypsies had come from Bohemia. The first usage of the term Bohemianism in its current meaning was by French journalist Félix Pyat in 1834 in an article called "Les artistes". He derogatorily described this personality type as "alien and bizarre ... outside the law, beyond the reaches of society ... they are the Bohemians of today" (tr. Levi Asher). The term became commonplace in the 1850s when the writer Henri Murger began publishing and staging a series of stories called La Vie de Bohème which would eventually become the world-known Puccini opera La bohème. 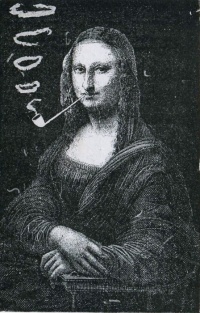 In the twentieth century, the bohemian impulse was famously seen in the 1940s hipsters, the 1950s Beat generation (exemplified by writers such as William S. Burroughs, Allen Ginsberg, Jack Kerouac, and Lawrence Ferlinghetti), the much more widespread 1960s counterculture, and 1970s hippies. 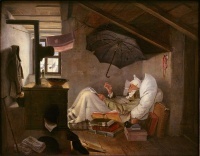 Literary "Bohemians" were associated in the French imagination with roving Romani people (called "bohemians" because they were believed to have arrived from Bohemia), outsiders apart from conventional society and untroubled by its disapproval. The term carries a connotation of arcane enlightenment (the opposite of Philistines), and also carries a less frequently intended, pejorative connotation of carelessness about personal hygiene and marital fidelity. The Spanish Gypsy in the French opera "Carmen" set in Seville, is referred to as a "bohémienne" in Meilhac and Halévy's libretto (1875). Henri Murger's collection of short stories "Scènes de la Vie de Bohème" ("Scenes of Bohemian Life"), published in 1845, was written to glorify and legitimize Bohemia. Murger's collection formed the basis of Giacomo Puccini's opera La bohème (1896). Puccini's work, in turn, became source material for Jonathan Larson's musical Rent. 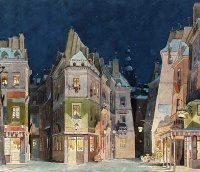 Like Puccini, Larson explores a Bohemian enclave in a dense urban area, in this case, New York City at the end of the twentieth century. The show features a song, "La Vie Boheme", which celebrates postmodern Bohemian culture. In England, Bohemian in this sense initially was popularized in William Makepeace Thackeray's novel, Vanity Fair, published in 1848. Public perceptions of the alternative lifestyles supposedly led by artists were further molded by George du Maurier's highly romanticized best-selling novel of Bohemian culture Trilby (1894). The novel outlines the fortunes of three expatriate English artists, their Irish model, and two very colorful Central European musicians, in the artist quarter of Paris. In 1845, Bohemian nationals began to emigrate to the United States, and from 1848 the wave included some of the radicals and ex-priests who had wanted a constitutional government. In New York City in 1857, a group of some 15–20 young, cultured journalists flourished as self-described "Bohemians" until the American Civil War began in 1860. Similar groups in other cities were broken up as well; reporters spread out to report on the conflict. During the war, correspondents began to assume the title "Bohemian", and newspapermen in general took up the moniker. Bohemian became synonymous with newspaper writer. In 1866, war correspondent Junius Henri Browne, who wrote for the New York Tribune and Harper's Magazine, described "Bohemian" journalists such as he was, as well as the few carefree women and lighthearted men he encountered during the war years. Despite his views, Sterling associated very closely with the Bohemian Club, and caroused with artist and industrialist alike at the Bohemian Grove. In New York City, an organization of musicians was formed in 1907 by pianist Rafael Joseffy with friends such as Rubin Goldmark, called "The Bohemians (New York Musicians' Club)". In the twentieth century United States, the bohemian impulse was famously seen in the 1940s hipsters, the 1950s Beat generation (exemplified by writers such as William S. Burroughs, Allen Ginsberg, Jack Kerouac, and Lawrence Ferlinghetti), the much more widespread 1960s counterculture, and 1970s hippies. Modernity and its Discontents (1964) by César Graña. Unless indicated otherwise, the text in this article is either based on Wikipedia article "Bohemianism" or another language Wikipedia page thereof used under the terms of the GNU Free Documentation License; or on original research by Jahsonic and friends. See Art and Popular Culture's copyright notice.